Place the rice flour into a large bowl. First, whisk in the hot water. Then, add the cold water and mix well to combine. Using your hands, form dough into a ball. Cover and set aside. In a grease-free pan, toast peanuts and black sesame until lightly roasted. Transfer to a food processor and finely grind. Then, place into a small bowl and add confectioner’s sugar and maple syrup. Mix until a sticky paste forms. Place filling onto a cutting board and divide into four equal portions. Roll each portion into a small log and cut into hazelnut-sized pieces. Lightly cover hands with rice flour. Take a small portion of the dough (approx. 1 tablespoon) and form a small dough round. Place filling in the center and wrap dough around to form a ball. Cover with rice flour. Add water to a large saucepan and bring to a boil. 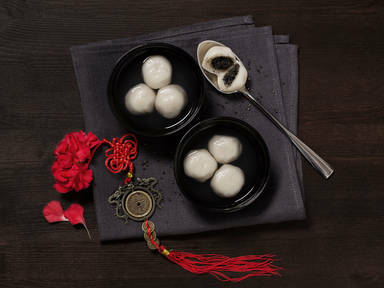 Place balls in boiling water and reduce heat. Immediately stir to avoid sticking. Cover and allow to steep for approx. 3 – 5 min. until dumplings rise to the surface. Serve with cooking water.